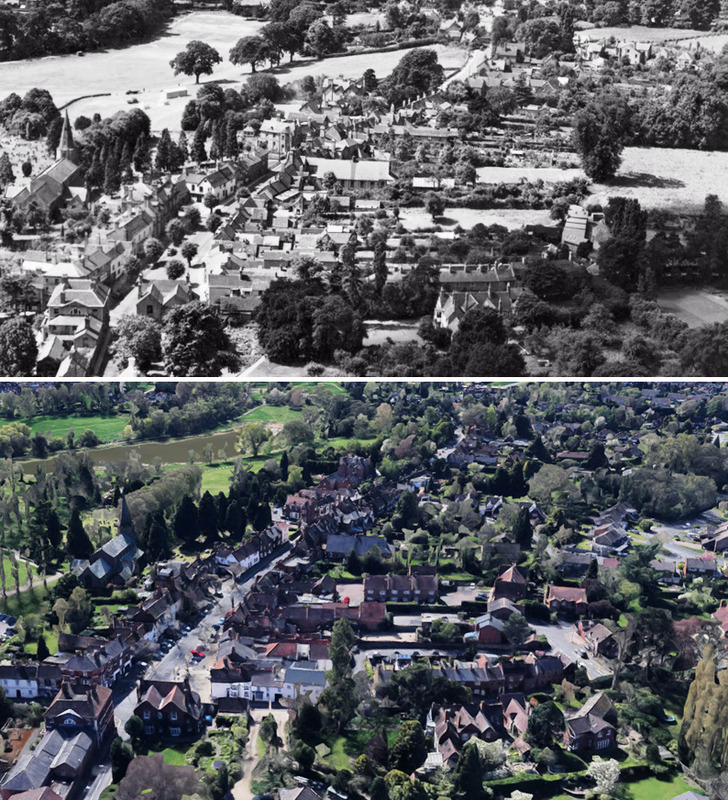 This Then & Now image is a cropped portion of aerial photo EAW025675 taken from the wonderful Britain From Above website. If you have a moment, I can highly recommend registering for free on the website, because doing so enables you to zoom into their high resolution images to examine details close up. This particular image shows the High Street and town looking towards the castle from the north-east, taken in 1949. The ‘now’ image is an equivalent image taken from Google Maps. To orientate yourself, Abbotsford is in the bottom left hand corner and High Street runs diagonally up to the top right hand corner in the direction of the Castle. The fields on the right of the ‘then’ image were built on for Elmbank and Berkeley Roads in the 1960s, with an alleyway running down to join the High Street along the hedge boundary of the Widow’s Charity Almshouses. High Street itself is little changed of course, but what is noticeable is the number of outbuildings still evident in the 1949 image behind buildings on the north side of High Street (right hand side of the image). If you look closely at the original image you can see a jumble of little roofs between Fieldgate Lane and the large tiled roof of the Parochial Hall (centre). Many of those plots were subsequently eaten into by the building of Fancott Drive and Monmouth Close. Outbuildings like these were often used for industrial purposes, such as in the horn comb industry, once so prevalent in the town that it became known as ‘Little Brummingham’ due to the large number of workshops. Graham Gould wrote an article in Kenilworth History 2011 about the horn comb industry along the High Street and New Row (Castle Hill) in which he says “The Horncomb Industry in Kenilworth in the 17th and 18th century was of a major importance to the Town. On studying the house deeds for High Street and New Row, one can see that the majority of the people were employed in the trade”. The out buildings shown here in 1949 are some of the last remnants of that, and other contemporary industries.